The tradition school-book portrayal of the international balance of power has long painted global peace as the product of a bipolar world and a Cold War, won by the USA against the USSR in 1991. This portrayal is somewhat lacking because it leaves out China. Although a titan of history, her power had declined somewhat following the 19th century Opium Wars and the Maoist period, dominated by the search for a national modernisation. During the 1970s, Henry Kissinger was the first Westerner to recognise China’s potential in international affairs. A few years later, Paul Kennedy, in his bestseller The Rise and Fall of Great Powers, reminded the general public of the cyclical nature of the appearance and disappearance of empires, drawing attention to the fragility of the hegemony attributed to the USA by western powers. Financial Times journalist Gideon Rachman extends Paul’s Kennedy’s analysis by claiming that the alleged diplomatic weakness of the Obama presidency is not the fault of his administration. Rather, it is sign of an aging superpower fading in a new century characterised by the arrival of Asia, and in particular, China. For Rachman, the growing power of China, unlike that attributed to Japan last century, is an inevitable reality. A reality based on the historical potential of an ancient empire, that the West will only really have overpowered for less than two centuries, and economic strength launched by the policies of Deng Xiaoping and Hu Jintao. 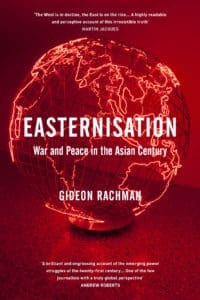 Gideon Rachman’s thesis is largely inspired by Thucydide and the study of relations between Sparta and Athens; according to these, the rise of a new power is a source of tension between states and can lead to war. Will Washington and Beijing play out the Greek cities? Easternisation questions the new direction taken by Xi Jinping since his arrival in power in 2012 without claiming to bring a definitive answer. At the same time, he makes the debates that divide international relations experts on America and China accessible to all.